Because of their small size and relatively low cost, sunflower seeds can be a convenient snack when you're on the go. And while sunflower seeds are calorie-dense, they can still be beneficial for weight loss. Successful dieting ultimately depends on your ability to consume fewer calories than you burn each day, but that doesn't mean you have to stop eating calorie-dense foods. Some foods, such as sunflower seeds, have other beneficial nutritional characteristics that can aid in weight management. 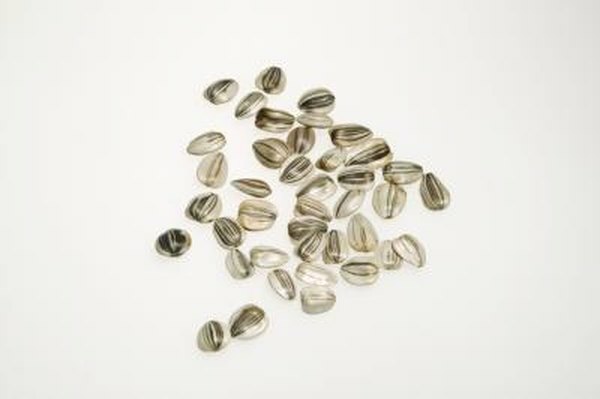 Sunflower seeds are calorie-dense, as 1 ounce of dry-roasted sunflower seeds has 165 calories. This comprises about 8 percent of the daily suggested calorie intake of 2,000, but you can burn off 165 calories efficiently if you are active. For example, you could burn off the calories in 1 ounce. of sunflower seeds with 23 minutes of hiking or about 60 minutes of walking at a 2 mile-per-hour pace. One reason you may wish to continue eating sunflower seeds, even when dieting, is that sunflower seeds are rich in dietary fiber. A serving of sunflower seeds provides more than 3 grams of fiber. Dietary fiber is a vital component of a healthy diet, as it aids in digestion and promotes regular bowel movements. In addition, dietary fiber promotes feelings of satiety, so it can help you lose weight. Consuming a fiber-rich diet may prevent you from overeating. Sunflower seeds are rich in protein, a vital nutrient that aids in growth and repair of your body tissues. A serving of sunflower seeds provides 5.5 grams of protein. According to a study from the February 2002 issue of the "Journal of the American College of Nutrition," consuming a high-protein diet can aid in weight loss because your body burns more calories digesting protein than it does digesting other nutrients. Sunflower seeds are also rich in leucine, an amino acid that may promote reductions in fat deposition, according to research from the June 2007 issue of "Diabetes." Sunflower seeds are high in calories due to the high fat content. Each serving of sunflower seeds has 14 grams of fat, of which just 1.5 grams is saturated. Although fat adds nine calories per gram, eschewing fatty foods while dieting can be detrimental. Fat provides flavor and promotes satiety, so it can aid in weight loss. In addition, a study published in the July 2008 issue of the "New England Journal of Medicine" found that low-fat diets were less effective for weight loss than diets higher in fat.